Come join the fun and have a boot stomping good time in Frontierland with all your favourite Western pals! 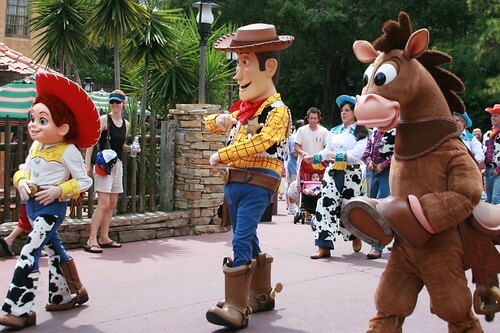 Sadly, as with all these mini entertainment offerings, the characters are reluctant to meet their fans in fear of mass mobbing (if one is allowed, then everyone will want to!). 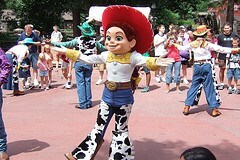 Woody's Cowboy Camp was a small interactive show featuring Woody, Jessie, Bullseye, and their Cowboy friends. It was part of the Year of a Million Dreams and included audience participation. 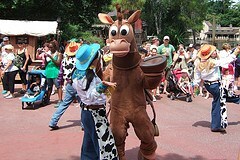 Sadly it stopped when the Year of a Million Dreams promotion ended.